Nicolas Touchette, CEO, and Frédéric Bouthillier, COO, of Groupe Touchette. 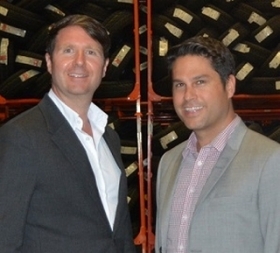 MONTRÉAL -- Dealer Tire L.L.C, the Cleveland, Ohio-based wholesaler dedicated to serving new car dealers, has agreed to sell its Canadian arm, Dealer Tire Canada U.L.C., to Groupe Touchette Inc., a Montreal-based tire wholesaler and retailer. The transaction is scheduled to close on Aug. 31, at which time all assets and contracts will be transferred to Groupe Touchette. Financial details are not being disclosed. "Our ultimate objective is to create a team with one single goal in mind: offer the best service to OEMs and their car dealer networks in Canada," says Nicolas Touchette, CEO of Groupe Touchette. "We look forward to expanding our business and servicing Dealer Tire Canada's OEM and dealer customers." Upon closing, Groupe Touchette, with its market knowledge and logistical network, will operate from more than 25 warehouses across Canada, enhancing the service level to existing Dealer Tire Canada customers. "We are very excited about our collaborative agreement with Groupe Touchette," said Dealer Tire CEO Scott Mueller. "We were thoughtful in choosing a partner that we believed would continue to provide superior service to our OEM and dealer customers while also having a similar culture where our employees would continue to thrive." Groupe Touchette and Dealer Tire also have agreed to enter into a long-term technology services agreement whereby the companies will partner to support current Dealer Tire Canada OEM programs with value-added tools and technology to drive sales and support at Canadian-based dealerships. Privately owned by Nicolas Touchette and Frédéric Bouthillier, Groupe Touchette has been active in the tire industry for more than 35 years. It focuses on value-added tire distribution and is considered to be one of only three national providers. Groupe Touchette operates two tire distribution sell-out programs called TireLink and DT Tire, and has four retail dealership groups – Tireland and Tire Partners in western Canada, IciPneu and Touchette pneu mécanique in Quebec. The group’s total employment is more than 350.